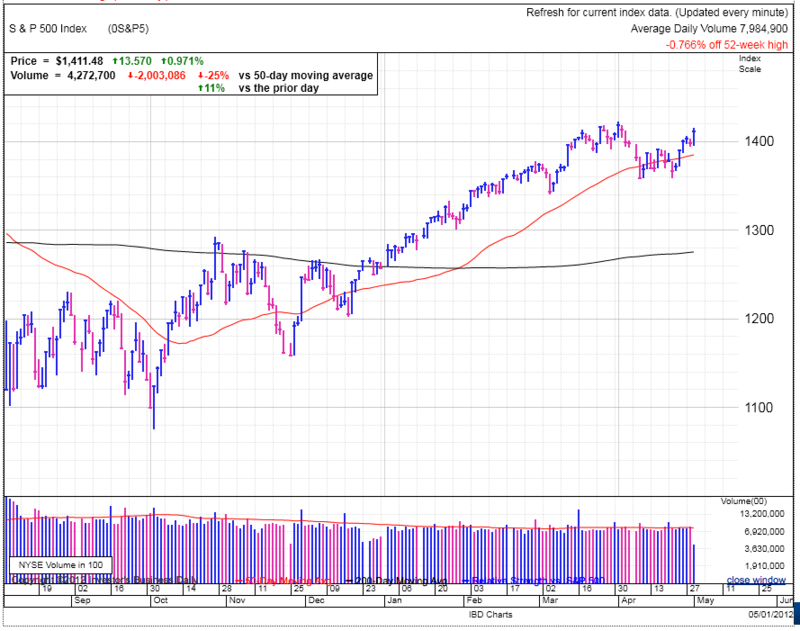 The indexes are up nicely today, reinforcing last week’s technical breakout above the recent 50dma consolidation. Obviously my reluctance regarding the market so far has been misguided and no doubt an army of people feeling the same way I do is partially responsible for the upside we are witnessing. The interesting thing will seeing how far this can go. A big push behind last quarter’s monster rally was institutional investors playing catch up as the market left them in the dust. At the moment the second quarter is in the red, so there is no pressure for big money to chase the market. Of course that could change if we start making new highs with a few more days like today. Friday’s employment number will be a big headline grabber, but it seems like it is less of a market moving event than it was earlier in the economic recovery. No doubt a big surprise either way will shock the market, but anything that approaches expectations should not create too much of a wave by itself. Of course that doesn’t mean investors won’t use it as an excuse to trade a preconceived bias they have and that could potentially trigger a larger move if enough people jump on board as part of self-fulfilling prophecy. FIRE is having a great day, up 13% after earnings and is adding to its already impressive gains since its Feb breakout. 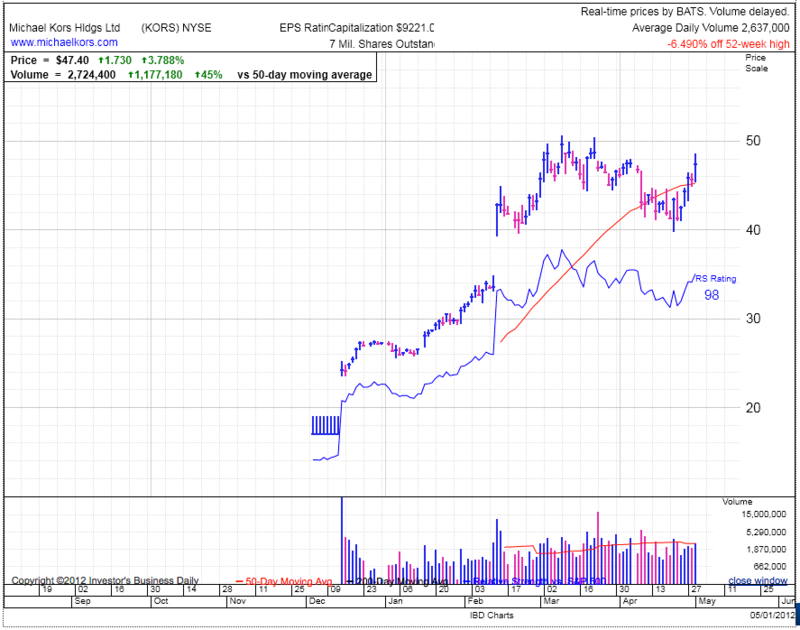 KORS is jumping off of its 50 in strong volume today, giving a solid entry or add point for a bull. BWLD is flirting with its 50, but struggling to hold above it in afternoon trade. AAPL found support at the 50 earlier in the day, but has since given back all those gains and is currently flat. I added a tab to the CrackedMarket website with a watch-list of the stocks I am following. This is far from a comprehensive list and many big winners will not make the list simply because by design it will be highly exclusive instead of inclusive. The goal is not to find every stock that makes a big move, but instead be focused on identifying a highly targeted list with as few false-positives as possible. Because of the advantages of scalability in stock investing, we only need to identify one or two big winners each year to produce great results as long as we allocate enough capital to each good idea. The bane of a portfolio is getting stuck with dead money stocks that don’t move and water down any winning positions. This is why I am merciless when cutting otherwise good stocks from consideration. Further, the goal is not to find obscure stocks no one knows about yet, but instead target stocks that are starting to show up on my radar multiple times and in the early stage of generating buzz across the larger investing community.